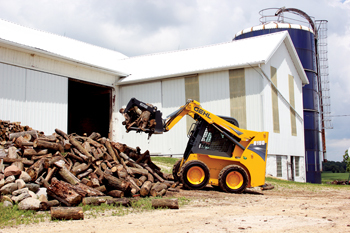 Gehl has announced the all-new mid-frame R Series radial-lift skid loaders. These include three new models – a brand new addition to the line – the R150 with 1,500 lbs (680 kg) capacity, the R135 (replacing the 4240E), and the R165 (replacing the 4640E Power2). These skid loaders feature an all-new operator station with an integrated digital display, new load arm design with increased visibility, Yanmar-powered Tier IV engines and several serviceability enhancements. The R135, R150 and R165 radial-lift skid loaders fall into the mid-frame category, bringing unparalleled versatility to the jobsite. When equipped with optional counterweights, the rated operating capacities range from 1,500 lbs (680 kg) on the R135 to 1,800 lbs (816.5 kg) on the R165. Lift heights reach up to 119” (3,023 mm) on the R150 and R165. These mid-size skid loaders come equipped with emissions compliant Tier IV Yanmar engines that incorporate DPF (diesel particulate filter) technology. This engine technology is environmentally sound and does not require fuel after-treatments, such as urea. With maximum torque ratings from 107.8 ft.-lbs (146 Nm) on the R135 and R150 to 178 ft-lbs (241 Nm) on the R165, these machines are equipped with the power needed to tackle demanding jobs. The new R Series skid loaders feature standard proportional auxiliary hydraulics for maximum precision and infinitely adjustable flow control and achieve flow rates from 17 gpm (64.4 L/min) on the R135 and R150 to 18.9 gpm (71.4 L/min) on the R165. Impressive breakout forces deliver optimal digging and lifting performance. Faster cycle times further enhance productivity on the jobsite. Pressure-relieving hydraulic couplers make attachment changes simple and safe. The state-of-the-art operator’s compartment on the new R Series skid loaders leaves little to be desired. A front-lifting restraint bar and armrests with multiple adjustments enhance operator comfort and safety. The mechanical or air-ride suspension seat options deliver outstanding comfort. Creature comforts – such as automatic dome light, cup holder, 12-volt outlet, storage tray and multiple air vents – come standard on these intuitive loaders. A cabforward design and lowered rear towers deliver unmatched visibility to the bucket edge and rear of the machine. The optional pressurised cab enclosure, with sound reduction material and a rear-mounted air filter, provides a cleaner, quieter, climate-controlled working environment. Controllability and ease of use are part of the package on the new R Series skid loaders. One can customise the skid loader with three control options: T-bar, hand/foot, and joystick (R165 only). Auxiliary hydraulic controls are located on the joystick in all configurations for easy access. A fully-customisable digital colour display provides coolant, fuel, battery, environmental, engine regeneration information and other features in real time.